Where Brooklyn at?!?! That’s right, folks. The hills are alive with the sausages of Brooklyn. Quite honestly I went into this review with very few expectations. 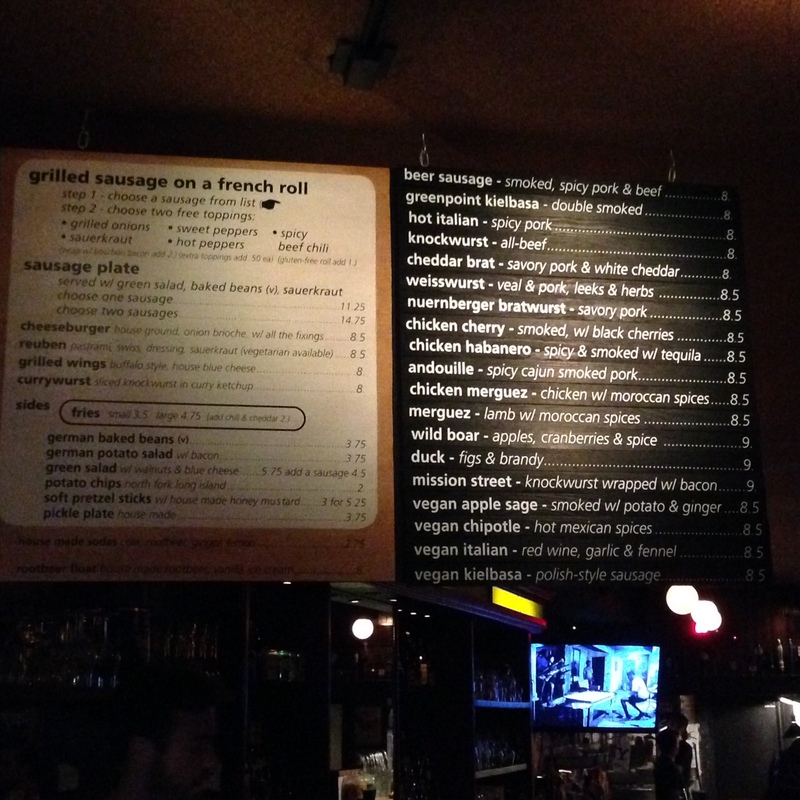 I had no idea what I was getting into, and all I really knew was that sausages and beer were a featured partnership in this establishment. Nothing else has to be said. I can’t think of anything else I’d rather do. So, without further delay I put on my most ironic outfit, tightest pants, and glasses that are absolutely unnecessary for my vision and hopped on the L train. What a scene. 24 beers on tap. 20 different sausages. In the heart of Williamsburg, Rosamunde not only offers a variety of high quality weenies and libations, it also exudes a great vibe. It certainly embodies classic Brooklyn stereotypes, but they are the good stereotypes and they are subtle. For example, they have two TV’s, each playing a different movie the entire time we were inside. One TV had Sammy Davis Jr. and Tony Bennett twirling cute little umbrellas and hanging from windows. The other featured a bloody, murderous Chinese man smiling and playing a ukulele. Similar, I suppose. The beer selection was as crafty as it gets, and super high quality. These beers were all top of the line and rare. I ordered a La Fin du Monde by Unibroue. What an incredible beer. It is 9 percent alcohol and has this golden caramel hue that has previously only been seen in Twix commercials. Find this beer now and consume it. I don’t care what you’re doing, it will be worth it. Driving? In church? Having a baby? Stop and drink this beer. It will be worth it. I digress, my apologies, this is a hot dog blog. The best sausage was said to be the cheddar brat. 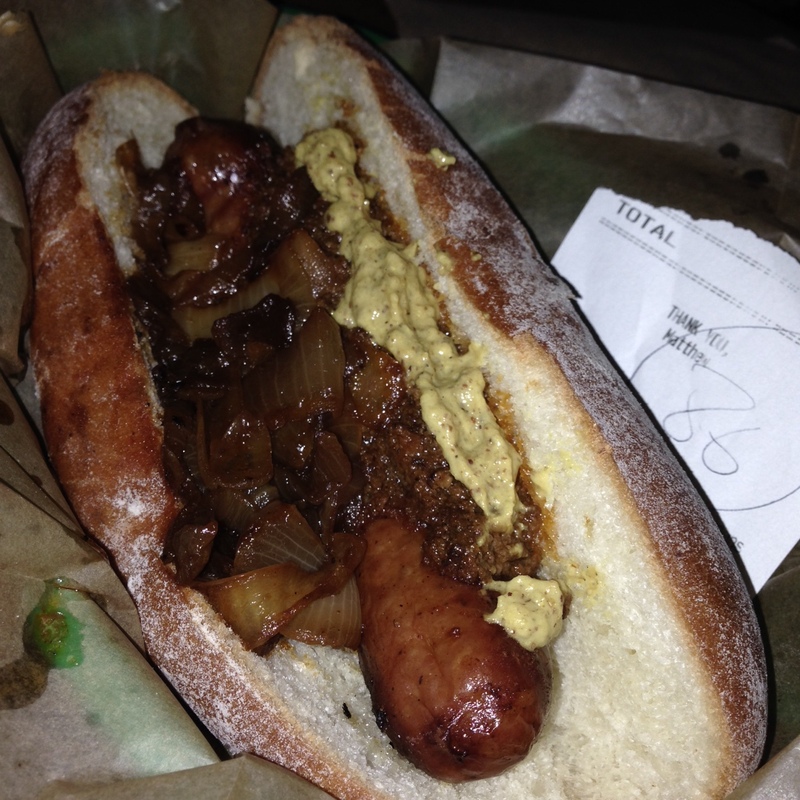 I ordered it with chili and onions, then added some spicy brown mustard at the condiment stand. No yellow was available. I don’t know what it is about New York, but people really don’t appreciate yellow mustard as much as they should. This was the best looking weenie I’ve reviewed yet. Literally, this was the juiciest sausage that has ever juiced. The bun was this massive powdery floury thing that I was very unfamiliar with at first but eventually came to love. Kind of like SSBD’s. (Short sleeved button downs). Oh my. Ohhhhh my. That’s a sausage. I enjoyed that. However, I am not lying when I say I loved Rosamunde. I will absolutely be back and it will be incredible again. Go there if you have any sense of decency. Whatever you’re doing, stop, and go there. It will be worth it. Mowing grass? Riding a pony? Watching the WWE? Stop at Rosamunde. It will be worth it.